2In a large bowl, whisk together the buttermilk, 1/2 cup of the sugar, the egg yolks, lemon juice, flour and butter until smooth. In a clean glass or stainless steel bowl, beat the egg whites until soft peaks form; continue beating, gradually adding the remaining 1/2 cup sugar, until the mixture is thick and glossy and holds stiff peaks. Gently fold the whites into the buttermilk mixture and scrape into an 8”x8” or 9”x9” pan that has been sprayed with nonstick spray. 3Set the pan into a larger pan - 9”x13” works well - and pour enough hot water into the larger pan to come halfway up the sides of the inner pan. 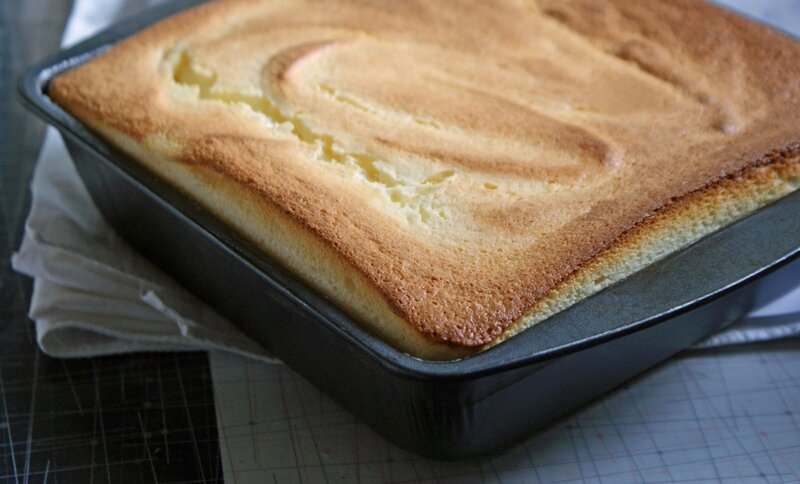 Bake for about 45 minutes, until the cake is puffed and golden, and the top is springy to the touch. 4Remove the cake from the water bath and cool for at least half an hour if you want to serve it warm, or cool it completely and then chill in the refrigerator before serving in shallow bowls, with a spoon.